Jaipur : Dr. Ajay Kumar, Secretary – Defence Production was on a visit to pink city, Jaipur. He was here to visit India’s first of its kind Swiss precision and assembly plant at Mahindra SEZ, RS India.Motive of RUJ Group was to showcase RS India for Aerospace and Defence (A&D) production hub, where RS India can cater to India's demand for precision engineering machinery on the one hand, and tools and skilled personnel to execute those demands on the other with BSDU. Dr. Ajay Kumar also visited Bhartiya Skill Development University (BSDU) of RUJ Group. He expressed his gratitude on BSDU’s contribution on Skill India initiative. His visit was escorted by Dr. (Brig.) S.S. Pabla, President of BSDU and other team members. 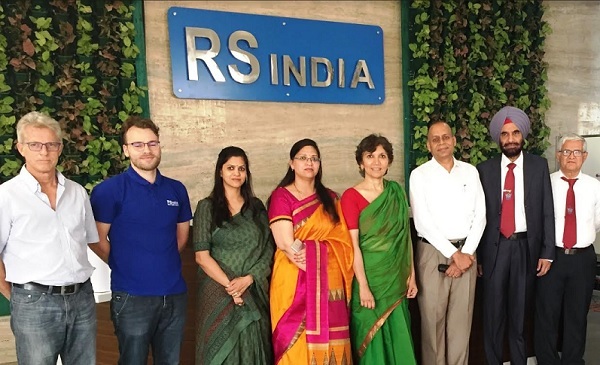 RS India is incorporated with the core objective of manufacturing and assembling of high Precision Parts, Metal Anodizing, Painting and Heat Treatment, Surgical Items and Cutlery and other high quality Products etc. Jayant Joshi, Managing Director, RS India said, “The whole idea of visit of Dr. Ajay Kumar, Secretary Defence Production – is looked at as a great opportunity to showcase Bhartiya Skill Development University and RS India (Precision parts manufacturing Plant) to the most forward looking Department/Ministry in GOI. RUJ & SRM Mechanics Private Limited produceshigh quality precision parts from small to midsize dimensions and quantities, pre-assembled and tested components, medical devices for surgery etc. The production site also includes a training centre, where up to 90 trainees at a time can complete a basic training as polytechnicians. The company will be soon obtaining ISO 9001 and 13485 (medical devices) certification along with ISO 14001 (Environmental Aspects) and OHSAS 18001 (Health and Safety) certifications.